Eight people killed this weekend due to those storms. Really sad. It's north of the Carolinas and Virginia now, so your friends shouldn't have any trouble today driving. Oh dear, I hadn't heard that number Diane. Dreadful. My friends were in Charlotte last night, they said the storm had been downgraded anyway. Just wondering if they make liners for the Instant Pot like they do for the slow cookers. When you make something sticky or gooey, you just use the disposable liner. What are they made of Denise? I will check into it, hadn't heard of liners before. Apparently no one makes anything for the Instant Pot but several folks online talked about using a silicon basket for messy foods. I seem to remember Ivy (The Happy Whisk) bought a silicone insert for her Pot. I will have to ask her about it. As Diane just posted above, 8 people killed. Dreadful tornadoes with 140 mph winds. I hadn't made macaroni and cheese in years. 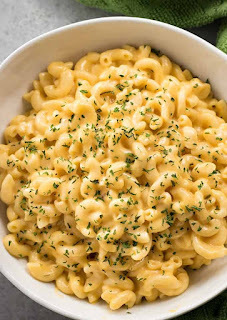 My daughter's favorite food, mac and cheese. I'll have to let her know about using the chicken stock! Never thought of that before. Bad weather seems to be on the rise these days... Good luck with the dr visits and hair cut! Funny, and we hadn't eaten it in many a long year Lisa. Yes, the bad weather is ostensibly caused by global warming. Thanks. All the hot air coming out of Trump should cause much more global warming. LOL Did you hear what he said to the French Denise, they should use aerial water bombing. Apparently that would damage the cathedral even more.